If you decide to use the help of a custom writing service, you need to be sure about these 4 most important things: quality, timeliness, originality and privacy of the paper that is written for you. In the majority of cases you have to pay beforehand, not knowing exactly what level of service you are going to receive. There is always a big risk that collaboration with one of such writing companies might turn into a bad experience of losing time and money or lead to even worse consequences. That is why our untiring team continues to keep an eye on the websites that guarantee the completion of paper writing orders. This time we are examining Darwinessay.net that right on its home page promises to write for us the best essay ever. Is it really so? Let us see. 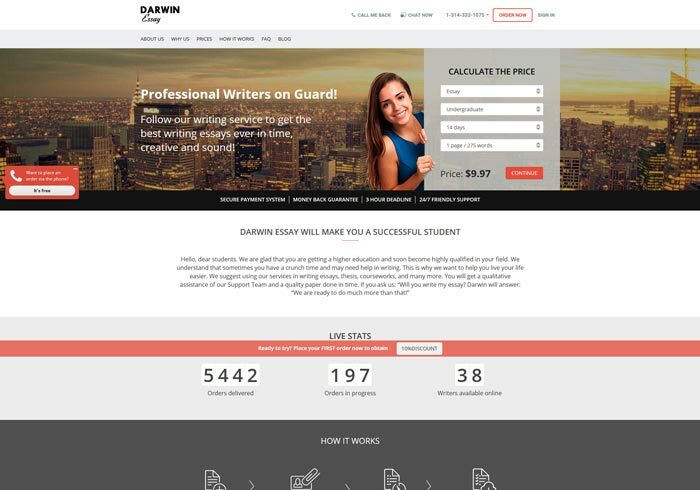 The first thing a potential Darwinessay.net customer sees on their site is the reassurance of the best quality and originality of the papers written by them. They claim to have such options as writing courseworks, theses, essays, immediate help of the support team and on-time delivery of orders to be available at their service. But when you look closer, you see that they have only 3 writers that specialize in Linguistics, Chemistry and Law plus one girl who writes blogs. In the numbers part of the site they, however, claim to have almost 70 writers more. We can only guess what kind of writers they are if they are not indicated in the “Our writers” section. Maybe low-level ones? This does not look reliable and means that the range of themes they can professionally work with is pretty limited. So, if they still accept your order of writing a thesis, for example, in Mathematics, there is a really high possibility that it will not correspond to the academic level quality. Plus, such restricted number of advanced level experts also makes us question timeliness and originality of their writings. They are currently having (or declare to have) more than 200 projects in progress and only 3 PhD level writers. How can they handle this amount of work and still keep the high quality of performance and meet deadlines? We really doubt such possibility. What About Prices and Refunds? At first sight Darwinessay.net prices seem pretty much average unless you see that they include only the number of pages you indicate, title page and reference page if needed. All other additional services that the completion of your order is most likely to require are fee-based. That includes proofreading and editing, plagiarism report, list of the materials used in your paper and some others. There are plenty of other writing companies that offer all these things gratis. The payment process at Darwinessay.net requires you to indicate your credit card details, which is not absolutely safe. Along with the safe payment they claim to have 100% refund guarantee. Although it is not clear in which cases you can get your money back and what the percentage is. The only thing you can be sure of, however, is that the money paid for the above-mentioned additional services will not be refunded. you will have only 3 free revisions of your paper, so if your nitpicky professor tells you to apply any further corrections, you will have to do it yourself or pay additional charge to the company.